Venezuelan National Guardsman took over the Plaza Altamira in Caracas and put down another provocation in the borough of Chacao. Suddenly on Sunday opposition leader and oligarch Henrique Capriles said for the first time that he was ready to talk with the Maduro government. Violence erupted in Venezuela in January. In a country sitting atop what some estimates put at 700 billion barrels of oil, it has become an annual bankster-sponsored occurrence. Bolivarian socialism does not jive withIlluminati plans to colonize the giant Lake Maracaibo oil patch. In January 2011 the Venezuelan oligarchy and their CIA/Big Oil backers held a rally in Caracas dubbedOperation Venezuela. The event, which was countered by supporters of Venezuelan President Hugo Chavez, marked the anniversary of the deposing of Marcos Perez Jimenez in Venezuela in 1958. But as with all recent CIA-sponsored Orange/Velvet/Cedar “revolutions”, the contradiction lies within the history books. Jimenez, you see, was a right-wing dictator, the polar opposite of Chavez. Jimenez privatized Venezuela’s economy while littering Caracas with the skyscrapers of multinational corporations and banks. He was tight with both Venezuela’s richest man Gustavo Cisneros and Creole Petroleum. Cisneros is a Rockefeller lieutenant who sits on the board at Bank of Nova Scotia – one of the Big 5 Canadian banks. It owned the 200 tons of gold recovered from beneath the World Trade Center post-911. For the next four decades Venezuela underwent an oil industry re-privatization and expansion, becoming the primary source of Four Horsemen oil bound for the US. When oil prices crashed in the early 1990’s Venezuela – once the most modern nation in Latin America – suffered an economic collapse. Its once-thriving middle class was largely thrown back into poverty. It was a wake-up call. In 1998 Fifth Republic Movement candidate Hugo Chavez was elected President with support from Venezuelan workers and peasants. He railed against US hegemony in his country, announced he would sell oil to friend Fidel Castro in Cuba on favorable terms and established diplomatic ties with Iraq. He announced a land reform program and installed Marxist economists at PDVSA – Venezuela’s national oil company. Chavez talked of diverting Venezuelan oil wealth from Western banks towards a grand development scheme for all of Latin America. OPEC’s articulate Secretary General until 2002 was Venezuelan Oil Minister Ali Rodriguez. 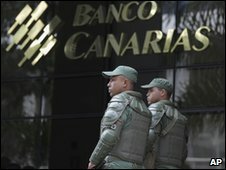 In early 2002 Venezuela’s ruling elite, led by Rockefeller crony Gustavo Cisneros and his Bank of Nova Scotia crowd, attempted to overthrow Chavez. There were reports of US Naval and Air Force involvement. In April Chavez stepped down. Within days, following angry protests from the Venezuelan working class, he was back in power. The pro-US general who led the attempted coup was charged with treason. El jeffe fled to Columbia where he was welcomed by the US-backed narco-terrorist Uribe government. In October the Venezuelan oligarchy took another run at Chavez. Again their putsch failed. On December 5, 2002 Chavez stated that the Venezuelan unrest was part of a plot, “to seize the country’s oil industry”. The latest plank in Chavez’ “Socialism for the 21st Century” program was to reform the financial sector, long dominated by the international banker cartel. Venezuela’s National Assembly had passed legislation that defined banking as a public service. The law requires banks in Venezuela to contribute more to social programs, housing construction efforts, and other social needs. It protects depositors by requiring the Superintendent of Banking Institutions to work in the interest of bank customers rather than stockholders. The Illuminati banksters had seen enough. Chavez soon developed a rapidly spreading cancer.